In this article we are going to review, what we believe to be the best electric filter coffee machines, currently available on the UK market. As you might guess, there are quite literally hundreds of types and brands of these popular machine available. Trying to find the right one, can therefore be a bit of a long and drawn out task. The good news for anyone wanting to buy a filter machine or maker is that these are a lot more affordable than a bean to cup machine, or your standard coffee machine. Typically filter coffee machines cost between £30-50, depending on which brand you prefer, and what precise features you want to have on the machine. Let' s take a closer look at what that means. This is what a typical filter coffee machine looks like, the machine with a glass carafe. Hopefully we can help you decide which machines to consider, based on our research. Just below, we have put together a top 10 list of the best filter coffee machines available in the UK market. We have then placed them in order, of the highest buyer rated first. So based completely on buyer reviews and their satisfaction with the product, we have listed those below. The ratings are based on a rating system out of 100%. Underneath the table we have then completed a review on each of the filter machines. These came out top of the list with respect to the highest buyer rating. It is from a very good brand. As it has a timer, and also because you can program it, it does carry a higher price point of around £80. That price point is unusually high for a filter machine though and will of course put many buyers off. This is a 10 cup filter coffee maker, that has a 1.25 litre capacity. It can also keep coffee hot for up to 2 hours. It is available in either black or white, however the main machine is made from a brushed steel. This filter machine is from the popular brand Morphy Richards is also highly rated. It costs in most Retail shops around £55, but is usually available online for around £43-45, depending on what offers are available. This stylish filter maker is available in red, black or brushed stainless steel. Buyers liked that as it gave them colour options for their kitchen. It has a programmable timer and a huge 1.8 litre capacity, which can make up to 12 cups of well brewed coffee. This is one of the cheaper filter makers, and can usually be found online for under £30. It gets very good buyer ratings and many people like this particular brand. This filter maker has a large 1.8 litre capacity, and can make up to 14 cups of filter coffee. If you don't want to spend a lot of money on a filter machine, and just need one that cane make a few cups a day, then this is a great choice to go for. It is quick to program, has a nice LED and a useful removable, washable filter. The hot plate will keep the coffee warm for up to 35 minutes. It also has a water level gauge and comes with a 2 Year Warranty. Priced at around £25, this is a machine that is relatively new to the UK marketplace, but do far buyers do seem to rate this coffee maker really well. This filter maker has a 1.25 litre capacity, and also has an important and useful anti-drip feature, that will help avoid any spills in your kitchen. It also has a permanent washable filter, so no requirement to have to buy any other paper filters. This is another choice from the higher end Melitta brand. It is one of the most expensive, with a price tag of around £55-60, depending on where you make your purchase. It is however a very high quality machine, and it does have a programmable timer. There is also an aroma selector, a drip stop, and a thermos lid that helps keep your coffee really hot. If you like great tasting coffee, that stays hot for a very long time, then this is the coffee maker for you. So at the moment those are the top filter machines. Any one of these would be a good choice for buyers who like and enjoy the taste of filtered coffee. The 5 below this are also good and we only include those as you may have a preferred brand that you want to go for. You may also have a preferred style and look there, that you would like to have in your kitchen. This Koölle filter maker is excellent value for money. You should be able to pick this machine up for under £25, and it is packed with great coffee making features. This model can make up to 15 cups at a time, and it also has a built-in timer, which can prove to be very useful indeed. Comes with a 2-year guarantee and also has a permanent filter and a hot plate to keep your coffee warm. Although at number 7 on our list, this is actually the biggest selling filter coffee machine, over at Amazon UK. This one has been on the market for a very long time, and many people buy this one, as they like the Russell Hobbs brand. It has a 1.25 litre capacity, and uses a flooding technology to get great flavour out of your coffee grains. If you can buy it for around £40, then we think it is very good value for money. 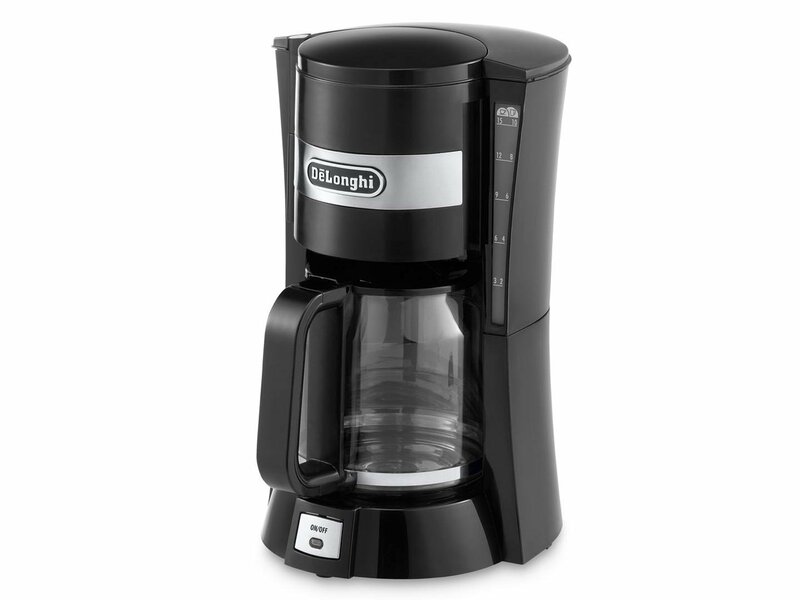 De'longhi are one of the best known coffee maker brands in the world. This model is priced at around £28 and for a brand of this quality, that is indeed a very good price. With an 80% buyer satisfaction rating, it overall gets good reviews. However as you can see, there are higher rated makers on the list, at around the same or even lower prices. This one can make up to 15 cups (10 mugs) but does also require the use of paper filters. Priced at around £30, this Andrew James model has also sold in its thousands. This machine has a very large 1.8 litre capacity, and also a reusable filter. The model also has a warming plate to help keep your coffee warm, and has an excellent and easy to read LED display for all the controls. This model heats up very quickly and looks very stylish. Rated at 78% buyer satisfaction, it is lower than we would like to see. And the last filter maker on our list is this one from Igenix. It is at the lower end of the price point for filter coffee machines, and buyers rate this one as 78% buyer satisfaction. It has a 1.5 litre capacity, and the keep warm function, will keep your coffee warm for about 45 minutes. It also uses a permanent filter, and it comes with a 2-year warranty. As you can see, there are plenty of types of filter coffee makers available on the UK market. Some people prefer to buy from a particular brand. Others may prefer to buy a particular style. In the table above, we have simply listed these, by the highest buyer rated first. On the list the prices do vary quite a bit. You will pay more for the better brands and also for the machines with more features, such as timers and reusable filters. Q - Do Filter Coffee Makers Make Espresso Style Coffees? A - No is the simple answer. Filter coffee is made by flooding water over coffee grains of a medium style grain. It makes a rich aroma coffee which is considered to be a mild taste. Espresso style coffees are made by forcing pressurised water through grains that have been very finely ground. Q - Do You Need to Use Paper Filters in a Filter Coffee Maker? A -Most filter coffee machines will have a metal washable filter. (Always check the exact model) If they have this then no you don't need paper filters. You can however still use paper filters along with the metal filter. The only reason you would do this is to make 100% sure there are no coffee grains left in the bottom of your cup. Q - Do Filter Coffee Makers Make Piping Hot Coffee? A -If you look at the list of complaints from buyers about filter coffee makers, this is always the single number one complaint. The machine takes cold water, heats it up, floods it over the grains inside the filter, and then the coffee drips into the glass carafe. That carafe sits on a hot plate (warming plate) and when the carafe gets filled, then your coffee is ready. If you pour and drink the coffee right away, then yes it is hot coffee. If however you leave this it will start to cool. Then it will not be piping hot. The warm up plates on most filter machines are OK for about 30 minutes. The manufacturers don't set these at a high temperature as it is a potential fire risk, and it would also burn the coffee and make it taste very bitter. For years filter coffee was the type of coffee that you got served in cafes, restaurants and many hotels. They arrived at your table with a glass carafe and poured the coffee and you could also get a top up if you wanted that. Filter coffee is simply where coffee beans are ground to a medium size of grain. Hot water is then poured over the grinds, and the coffee then drips through a filter and into a carafe. It is a very simple brewing method that has been around for years. The purpose of a filter coffee machine is simply to automate that process. The manufacturers over time have added features to these machines like timers, and the ability to program your machine. Melitta and Delonghi are coffee brands who will always be slightly more expensive than what we call the popular kitchen brands like Tower, Morphy Richards, Andrew James etc. They focus more on the actual coffee experience and usually are better designed machines. When buying a filter coffee maker, the first thing to always consider is if you like the appearance of the machine and then match that to your budget. If you like the look of it, and you think it is good value for money, then you can quickly narrow down your options. After that most filter machines will do a good job of making the actual coffee. You should then consider if a timer is important to you. In other words can you prepare your machine in the evening, and then set up a timer so as your coffee is read first thing in the morning. This simply means a timer that can be programmed for a number of days. Some buyers will want this but not that many. With a program function you can set up a range of timed options. It will always make the machine a great deal more expensive. With nay product you should always check the length of the warranty, and also precisely what the warranty covers. We know from our research that this type of machine lasts on average for about 5 years. It does of course depend on the amount of use that it gets. The only thing that can really go wrong with these is the motor inside. It will eventually burn out. You can help extend the life of this by descaling the machine once every couple of months.